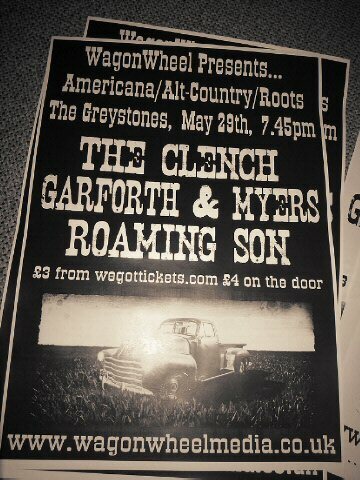 WagonWheel Presents… brings bank holiday eve fun to The Greystones on Sunday May 29th with another fine line up of live music. The Clench deliver whiskey-fuelled, blues-swamp-funk-country rock, to put it in a not very small nutshell. The six piece band make ‘music to ride horses by’ and their sound conjures up images of Western desert landscapes and cowboys. Garforth & Myers play unique and dark contemporary folk music. After initially meeting whilst involved separate musical projects Rory Garforth & Adam Myers started working on material together, this would form the basis of a selection of demos which attracted the attention of producers Keith Angel and Andy Seward; perhaps best known for their work with such folk/roots luminaries as Jon Boden, Kate Rusby, Martin Simpson, John Tams, Chris Drever et al. Thier initial release, the four track EP ‘Bonfires’ will be followed by their full debut album later this year. Roaming Son offer a mix of country tinged, swampy, Texan bluesy tremelo laden blasters & ballads. Delivered with vocals that have a distinct heartfelt earthy undertone, from brash to beautiful, the sound of chainsaws & rainbows. Advance tickets priced at £3 are available from http://www.wegottickets.com/event/112279 (booking fees apply). Entry on the night will be £4. Doors open 7.45pm.